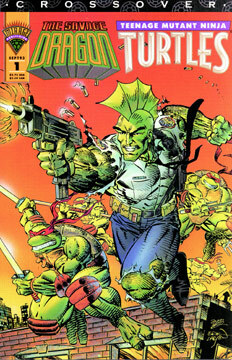 As the issue opens, the Savage Dragon has helped the Turtles defeat a living stone gargoyle. The Dragon decides to head back to Chicago, although the Turtles demand that he stay to help them find out what brought the gargoyle to life. SD feels that he’s done his job and grabs a cab to the airport. Meanwhile, a sorceress in an alleyway is angry at the interference by the “green-skinned freaks” that wrecked her plans. She summons another huge stone gargoyle that erupts through the pavement and grabs the taxi that holds the Savage Dragon. The monster pins Dragon to the street and the Turtles defend their friend. SD lifts the behemoth off of himself and then punches it, sending the beast flying into a nearby high voltage power station, killing it. A police officer arrives and takes SD down to the 13th Precinct, where he’s given the low down on the “Gargoyle Case” by an unhappy police chief. The Turtles find a tunnel in the sewers and investigate it. The sorceress is just ahead of them and decides to “lead them to their doom.” The TMNT discover that the tunnel results in a dead end and decide to hit the streets to get their bearings. As the Turtles get to the surface, they find the sorceress, named Viarago, waiting for them. Virago casts a spell that brings a nearby lion statue to life, and it attacks the green team. Dragon reads the police report about the case and learns that the gargoyles are abducting old ladies. As he discusses the case with the chief, a report about a disturbance comes in over the radio – SD heads out to investigate. Savage Dragon easily defeats the living statue and the Turtles capture Virago, who has drained all of her magical powers. The police arrive and arrest the sorceress, who vows to return. The threat doesn’t surprise anyone.